On October 13 2011 the European Space Agency (ESA) announced that it has officially invited Russia to become a full partner in the joint Euro-US ExoMars mission. The mission, which planned to launch an orbiter in 2016 and the rover in 2018, has suffered numerous setbacks primarily due to funding issues. The decision to invite Russia comes after budget issues forced NASA to downgrade its participation and cut their contribution of a second Atlas V rocket needed for the whole mission to launch. With only one rocket the mission would have to be cut in half and the ExoMars Trace Gas Orbiter would be forsaken in favor of the rover. The planned orbiter intended to use equipment provided almost entirely by NASA to detect trace gases in the Martian atmosphere, but has since been forced to look for alternative providers. And what other country has the funds, hardware, and interest to support a mission to Mars? 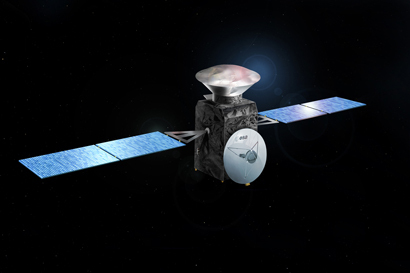 Russia does, so the ESA has turned to Russia, hoping that they will contribute a Proton rocket, equipment, and additional funding to the mission, in return for making them a full partner in the ExoMars project. This would enable them to conduct their own scientific experiments with the rover and orbiter while giving them a say in all aspects of the mission. ESA Director-General Jean-Jacques Dordain emphasized that “This could end up being an even grander mission than it would have with a full Russian participation, It’s not simply a matter of asking the Russians, ‘Please provide us a launcher.’” The added participation of Russia would ensure adequate funding and even allow for the mission to be expanded. Early reports suggest that Russia will accept the ESA's proposal. Oleg Korablyov, deputy chief of the Space Research Institute of the Russian Academy of Sciences was quoted by Ria Novosti as saying that "from the scientific point of view such [a] mission would be of great interest to us, it would boost our own Mars research," while claiming that "it would be a bargain and a tangible step towards Mars Net," a Russian plan to to create a network of meteorological stations on Mars. Russia has a long history of failure when it comes to Mars. Two Russian landers have made it to the surface, only to cease communication upon touch down. The Mars 2 and Mars 3 Orbiter's sent in late 1971 were the only real successes and they were terminated in August of 1972. The last Russian attempt at a mission to Mars was Mars 96 in 1996, but it suffered a launch failure. Russia does have a mission to the Martian moon Phobos scheduled to launch in November of 2011. This ambitious mission, dubbed Phobos-Grunt, will be an orbiter, lander, and sample return mission of the Martian moon. However the 2018 ExoMars lander mission would be their first attempt at reaching The Red Planet's surface since 1996. We won't know for sure until Russia makes an official announcement, but all indications point to them becoming full partners in the ExoMars mission. As more information emerges it will be posted here!